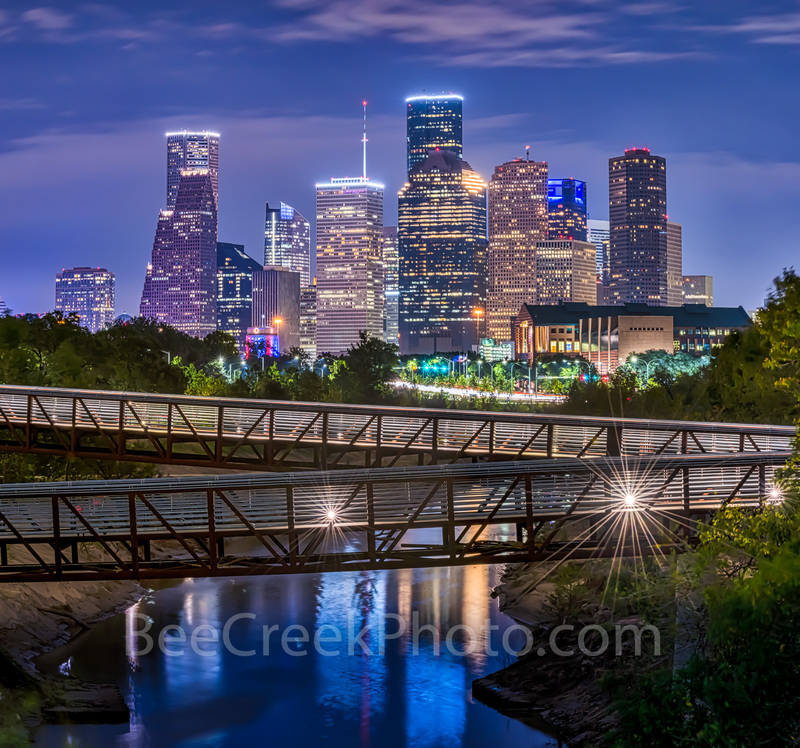 Houston Skyline Over Buffalo Bayou Pano - We captured a vertical pano of Rosemont pedestrian bridge and the Houston skyline over the Buffalo Bayou at night in downtown area of the city. Houston has a lot to offer with many parks, cultural events in the theater district, along with many sport and music event to name yet a few things to do. Houston also has a reputation of a place to see top notched performing art along with access to several museums in the area. The Theater distric performing art has nine major performing art group along with six performance halls. You can see Opera, a plays, the ballet and any number of music events including the well known Houston Symphony Orchestra Houston has some top notch restaurants and places to stay. Houston has a population of around 3.4 million people it the largest city in Texas and the fourth largest in the nation. The skyline of Houston is a very impressive site with some of the tallest modern skyscrapers buildings in the US. In this image you can see the Heritage Plaza, Chevron, Wells Fargo and the tallest building in Houston the J P Morgan Chase Tower at 1002 ft and it is the 17 tallest in the US. Houston is the seat of Harris county and was founded in 1837 near the banks of the Buffalo Bayou or Allen Landing as it is. Photo © copyright by Bee Creek Photography - Tod Grubbs / Cynthia Hestand.